I'm very proud to announce the Middlehammer Legacy Project 2018! All are welcome to get involved and all you have to do is contribute one of the models for the War Band, painted, and if desired converted, complete with a short back story and Warhammer Fantasy stat line. If you want to see what we did last year check out the 2017 Legacy Project - a 40k Mercenary Strikeforce - here, but as this is shamelessly stolen from inspired by the Oldhammer Legacy Warband competition that Axiom, from the most excellent Magpie and Old Lead, ran a few years back, even down to me nicking the format for the rules below (thanks again to Axiom for his advice on putting it together), I strongly recommend you check out their previous projects too. Any race from the Warhammer Fantasy universe can be included, provided the overall finished mini ties into the Weird/Chaos theme and fits the colour scheme. 2) A main colour and a secondary colour that will tie each model together in the finished group. We've gone for Purple as the main colour and Dirty or Off White as the secondary colour, which works for 3/4 Chaos Gods (4/5 if you count Malal, and I do!) and wouldn't be impossible to work into a Khorne mini if someone was dead keen! Colours/finishes of armour, weapons, skin colour, straps, gear and so on are all up to the individual painter to select. How does this Legacy War Band thing work anyway? 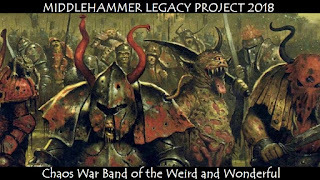 All participants agree to paint and contribute one model to the pre-agreed theme (decided via the Middlehammer facebook page) of Weird/Chaos War Band. You paint the model and post it to your friendly neighbourhood organiser (me - Paul/StuntCat). All contributors are entered into a draw, and the winner out of the hat wins the whole War Band for their collection! NB: I am going to contribute a mini, but I won't be putting my name in the draw. If we are really lucky and get loads of entries then we may split the minis into two War Bands and have two different winners. What's the time frame involved? The project starts as of 1st March and painting/modelling time lasts three months so you should have your model completed by end of May 2018. Models to be with me (in Bristol, UK) by Friday 15th June, with the draw taking place as soon as possible once I have all the entries in. Anything that you think fits with the theme agreed on the Middlehammer fb group. All Warhammer Fantasy races are permissible, as are Demons and Mutants. 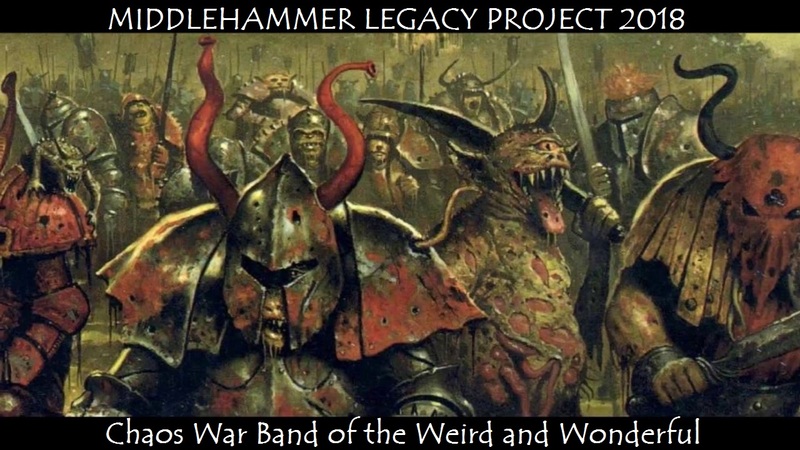 The basic idea is that it is inspired by the old school Realms of Chaos, so I'm guessing that many will go for something Middlehammer in period but themed towards RoC somehow. The model could be a straight up RoC era classic if you want, but it certainly doesn't have to be. It doesn't even have to be Games Workshop really, if you have something from another range or manufacturer then all good as long as you can make it fit the theme. Metal, plastic, or resin minis are all acceptable. Conversions are definitely welcome, but again, not essential. If people want to branch out into beasts, mounts, or chaos spawn, then that is all good too! It's a Weird/Chaos War Band you say? Shouldn't there be some kind of crazy table with 27 sub tables that I can spend hours generating random mutations and gifts for my character!? Yes! Yes there damn well are wise traveler, and you are very welcome to use them if you want to, but it is not a requirement. Tables from the original Realms of Chaos (RoC) books Slaves to Darkness (which has of course just enjoyed a very well deserved relaunch by Games Workshop!) and The Lost and the Damned are fantastic sources, but so are tables from Chaos army books from later editions, or maybe even Warhammer Fantasy Roleplay. The choice is up to you. If you do go down that root though it would be fantastic if you can either post all about it, or send me a message so I can include it one of the progress posts here. How will this War Band look coherent? Firstly, the colour scheme will be decided along with the broad theme, via the Middlehammer Facebook group by the people participating. Secondly, and again taking our lead from those who have gone before us, the winner does the basing for the War Band. This will ensure that a) the Strikeforce is coherently based and b) the Strikeforce fits into their own collection. Colours/finishes of armour, weapons, skin colour, straps, gear and so on are all up to the individual painter to select. What about Basing?It's not going to be a deal breaker what base you use (unless people start arguing with each other about proper base shape, in which case they will be chucked out!) but as it's not going to be a WFB unit that needs ranking up I suggest we go with round bases as they will be usable in more systems - the winner can always rebase on squares anyway if they want. 1.Participants need to register what model they will be contributing via the Middlehammer page as above. This blog will be updated with details as we go along. 2. Completed models, with a plain black round base of appropriate size, need to be sent to me (Bristol, UK) at the participants expense, and received by Friday 15th June 2018 (postal address to be supplied privately to participants). 3. Each model to be accompanied by a name, short back story (200 words max), and a Warhammer Fantasy stat line (via email or facebook message). 4. The draw will take hopefully take place during the second week of June. 5. The winner will be announced here and on the Middlehammer facebook group as sson as the draw has taken place. I will send the completed War Band to the winner via recorded delivery (at my expense), hopefully to arrive by end of June 2018. 6. The winner posts a picture of them enjoying their new minis on the Middlehammer facebook page with a massive cheesy grin and a big thank you to everyone who took part! 7. It would be great if the winner would also be up for writing a short post to go with said pictures and cheesy grin, saying how they are going to use and enjoy the minis, but not if they really don't want to. If you have any other questions please feel free to ask in the comments below, or on the Middlehammer face book group - Cheers!